The L111 system is a cost-efficient loudspeaker system. Its design conforms to category / type of protection I M 2 EEx ib I. The circuits of the loudspeaker system L111 depend on the power supply unit(s) feeding them with power and conform to category I M 2, type of protection EEx ib I. The intrinsically safe system circuits which remain operable after disconnection of the power supply units (in case of an increased methane content) are the intercom (LF) circuits and their connecting circuit / audio frequency circuit (wires WL1 and WL2 of the trunk cable) supplied with power from the rechargeable batteries of the speaking stations. Then they will conform to category I M 1, type of protection EEx ia I. The audio frequency circuit (a, b) conforms to category I M 1, type of protection EEx ia I. 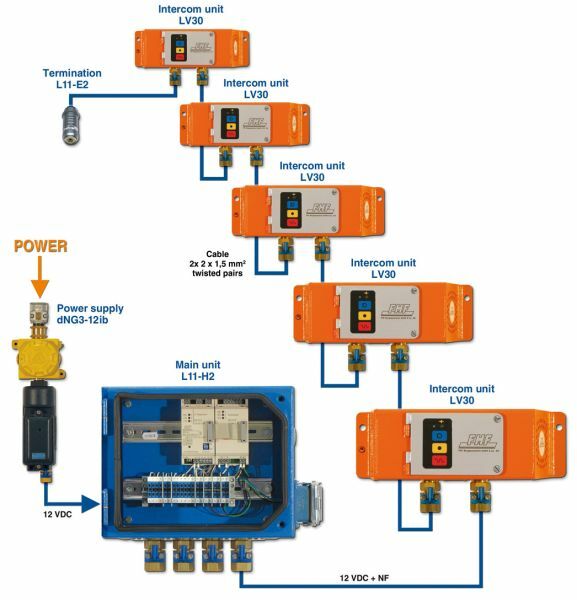 The intrinsically safe loudspeaker system L111 is configured as a line-type system, with the individual system components connected with each other via the 4-wire system line (e.g. L2YY(Q)Y 2x2x 1.5mm2). The main station L11-H2 represents the beginning of the system line and supplies all devices connected to this line with power. 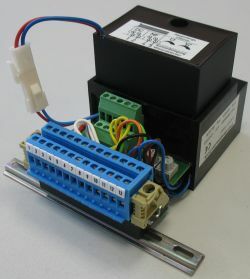 This power is supplied by the type NG3-12ib power supply unit connected to the main station L11-H2. Additionally, the main station L11-H2 serves as connecting point for the cables for controlling the start-up warning and the cables for coupling the L111 system to a WL200 switching system or other WL systems to generate a communication system with sectional start-up warning. The main station L11-H2 monitors the WL line for an open circuit and generates the required acoustic signals for "faulted WL line" and "start-up warning" which are passed on the system line to the existing speaking stations where they are emitted at high volume. The end unit L11-E2 forms the end of the system line. Speaking stations LV 30 with two loudspeakers, signal button LST 12 to emit the signal tone (1980 Hz / -6 dB). Maximally 40 units of type LV30 and/or LST12 can be looped into one supply section of the system line, and maximally 6 supply sections are approved. The DC wires of the system line between the supply sections must not be connected with each other. The max. system line length of a supply section is reached when a supply voltage of 8V at its end is reached or failed short to be reached. The max. length strongly depends on the number of devices installed, as these are supplied with power via the system line. Each speaking station has an integrated rechargeable battery which is constantly charged via the system line. On the one hand, this rechargeable battery enables a high volume at a low current consumption from the system line and, on the other hand, it enables a temporary emergency operation of the L111 system in case of mains failure or disconnection. If e.g. the mains voltage is disconnected due to an increased methane content, all speaking stations will remain operable by means of their integrated rechargeable battery certified for degree of protection EEx ia I.